Despite their obvious success, vaccines have never been universally embraced as a public good. From the earliest days of vaccination to the present time, there have been concerns about an individual's right to refuse to be immunized and about vaccine safety, and some pivotal events have led to public outcry and contributed to a weakening of public confidence in immunization (Figure 10.9). To lessen the credibility of those who opposed mandatory immunization because of concerns about the safety of smallpox vaccine, political cartoons from Jenner's day attempted to ridicule their fears by portraying early vaccinees sprouting the heads of cows (Wilson and Marcuse, 2001). Pasteur's first inoculations of humans with rabies vaccine were met with alarm and dismay. Skeptical about the concept of attenuation, many questioned intentionally giving a potentially deadly agent to a healthy person, and considered the vaccine-associated deaths to be murder (Plotkin and Orenstein, 2004). Both real and perceived concerns about vaccine safety remain important issues today, eroding trust in public-health and scientific entities promoting the use of vaccines. 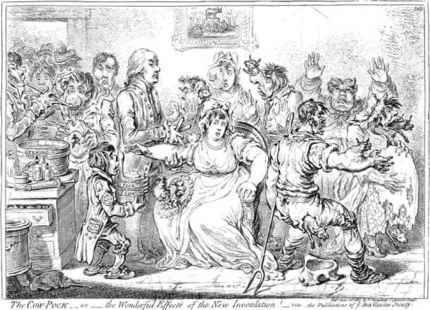 Figure 10.9 The cow pock or the wonderful effect of the new inoculation (1802). Source: Nature Reviews, a United Nations AIDS Wall Chart. The long road to the development of vaccines has not been an unbroken series of successes; unanticipated severe adverse events and terrible accidents have occurred as well. Among these calamities were the Mulkowal disaster in 1902 in India, in which 19 people died of tetanus contracted from contaminated whole-cell plague vaccine; the Lubeck disaster in Germany, in which 72 infants died after receiving BCG vaccine inadvertently infected with a virulent strain of Mycobacterium tuberculosis; and the Cutter Incident in 1955, in which two lots of the Salk vaccine given to 120,000 children were discovered to be incompletely inactivated due to a manufacturing error after 60 of the children and 89 of their family members contracted polio (Levine, 2004). As a result of these and other vaccine tragedies, the need for greater quality control, testing, and surveillance was recognized, leading to the development of regulations to increase the safety of vaccines (Junod, 2002; Plotkin and Orenstein, 2004). Vaccines are held to a higher safety standard than other medical interventions because, unlike most interventions that are aimed at the sick and the treatment of diseases, immunizations are given to the well to prevent disease. Therefore, the tolerance of side effects that sicken or disable a healthy person is understandably very low. Today, widespread immunization has reduced vaccine-preventable disease rates to such low levels that concern about the perceived risks of vaccination can weigh more heavily in individuals' vaccination decisions than concern for risks associated with acquiring the disease (Wilson and Marcuse, 2001). Therefore, a 1 in 10,000, or 1 in 100,000 chance of a serious side effect may result in a vaccine being considered unacceptable for a healthy child. The rhesus-human reassortant rotavirus vaccine was pulled from the US market by the manufacturer after the initial analysis of post-licensing surveillance reported that intussusception occurred in approximately 1 in 10,000 children receiving the vaccine. Because the vaccine was unacceptable in the US, it was deemed infeasible to attempt to use it in developing countries - this, despite the fact that more than 600,000 to 800,000 children die annually in low-income countries as a result of diarrheal disease caused by rotavirus (McPhillips and Marcuse, 2001). The body of epidemiological evidence favors rejection of a causal relationship between the MMR vaccine and autism. The committee also concludes that the body of epidemiological evidence favors rejection of a causal relationship between thimerosal-containing vaccines and autism. The committee further finds that potential biological mechanisms for vaccine-induced autism that have been generated to date are theoretical only. Given the lack of direct evidence for a biological mechanism and the fact that all well-designed epidemiological studies provide evidence of no association between thimerosal and autism, the committee recommends that cost-benefit assessments regarding the use of thimerosal-containing versus thime-rosal-free vaccines and other biological or pharmaceutical products, whether in the United States or other countries, should not include autism as a potential risk. These conclusions, however, have not served to fully reassure the American public about the safety of thimerosal as a vaccine preservative. In 2005, 22 states considered bills to ban the use of thimerosal-containing vaccines in children and pregnant women, with legislation being enacted in four of those states (Delaware, Illinois, Missouri, and New York) (AAP, 2005). Reports of the associations between MMR and autism, and thimerosal and autism, were rapidly disseminated worldwide by the media and the Internet. Today the flow of scientific information often circumvents the process of peer review and its attendant scientific scrutiny, leading to widespread public awareness of preliminary findings or even hypotheses before they have been replicated or substantiated. Media attention to case reports of adverse events following immunization contributes to public misunderstanding of the difference between a temporal and a causal association. The standards for proof in the legal system differ from those in science, resulting in findings against vaccines that are not supported by the scientific evidence but nonetheless exert a powerful influence in the court of public opinion and in legislatures. When these perceptions result in a substantial proportion of the community becoming hesitant to follow a recommendation to vaccinate, the risk to the public health may be great as decline in immunization coverage results in vaccine-preventable disease outbreaks and deaths (Levine and Levine, 1997; Kane, 1998). Public health authorities must balance the protection of the public health and the protection of individual liberty, including the right to refuse vaccination (Feudtner and Marcuse, 2001).